Samtavisi Cathedral is a large building situated on the banks of the Lekhura River 11 km from Kaspi. 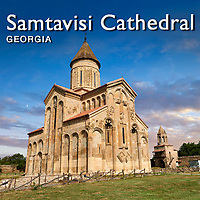 A monastery was founded on the site Samtavisi Cathedral occupies in 572 by Isidore, one of the thirteen Assyrian missionary monks who spread Christianity throughout Georgia. A Basilica style church was built to be replaced with the present cathedral building in the 10-11th century. 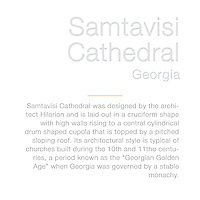 Samtavisi Cathedral was designed by the architect Hilarion and is laid out in a cruciform shape with high walls rising to a central cylindrical drum shaped cupola that is topped by a pitched sloping roof. Its architectural style is typical of churches built during the 10th and 11the centuries, a period known as the “Georgian Golden Age” when Georgia was governed by a stable monachy. The exterior of Samtavisi Cathedral has fine bas relief sculptures and mouldings around its blind arches. 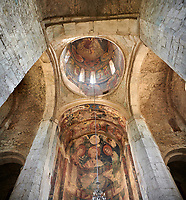 The interior has 17th century fresco remains which are sadly are badly damaged. The 17th century wall still stands in places around Samtavisi Cathedral as does its bell tower which also serves as the entrance to the Cathedral grounds.